The second the calendar turns to August, I feel like my summer is over. * But school psychs (and teachers) know what I am talking about…June is basically a detox month, July is the relaxing one, and August is the gearing up month. Even though I have a few weeks before we report back, August 1st starts a month of mental preparation to go back to school. There are a few rituals I have in order to psych (pun intended) myself up for going back. Of course, back to school shopping helps ease the transition, because who doesn’t love a good trip to Office Depot for pencils and nerd supplies? I went today, and I was lucky that Toddler B was over it in 10 minutes or I could have spent a bajillion dollars. Once your toddler starts running down the aisles screaming, “Chase! Chase!” it sort of ruins the zen moment of selecting the perfect ballpoint pens for writing poignant notes to parents and teachers. Next, I make a new school year’s resolution, like “I won’t take more than 3 reports home per semester” or “I will start a girls’ counseling group disguised as a knitting club.”** Making a new school year’s resolution helps me set a positive intention for the school year and helps me pick a manageable improvement goal. So how can I help ease your transition back to school? 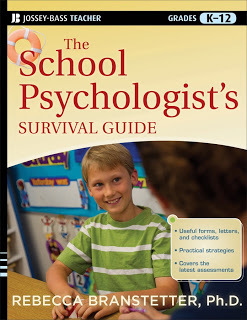 I’m not Oprah, so I can’t put a Nordstom’s gift card under your chair and declare “Evvvvvvverybody gets a new back to school wardroooooooobe!” But I can offer a little book I like to call, The School Psychologist’s Survival Guide. *** Evvvvveryone gets a copyyyyyyyyyy! Oh wait, I have Oprah generosity on a school psych budget. Okay, I can offer ONE lucky reader a copy of my book for back to school preparation! You can vow that this is the year you get organized and shape up your forms and report templates and all that jazz, and my book can hopefully help you with that. Or you can enjoy your last precious weeks and just put the book on your shelf for October when your back to school enthusiasm has fizzled out and you have a hojillion IEPs overdue. So, how do you win the book? Just comment here or on the Facebook page for the blog about how you gear up for back to school, or a new school year’s resolution and I will input your names into a random generator and announce the winner. Yippee! reading this post after the first sentence. **I actually did this a few years ago. It was super fun, but my principal had concerns. I believe her quote was, “You want to introduce sharp objects with those mean girls?” I am proud to say it was a gouge-free zone all year. ***Because that is what it is called. Comments on GAK. It's August. Buying school supplies also helps me gear up for the year. My most important purchase is a planner. It helps me stay organized. I gear up by not freaking out and savoring every last day with my little one before the madness of the school year begins. I write myself notes about how I want to improve my organization, based on blogs I've read and ideas I've come up with and put them in practice during the first couple of days back. I am also keeping a list of awesome resources I've found via Pinterest this summer, from apps for kids to counseling blog sites with lots of tools. Pick me! I'm coming back to School Psych in Colorado after having been working as a Counselor for three years in California and I need the refresher! My resolution this year is to be more proactive with my behavioral interventions and providing support to teachers with these. And exploring the dollar spot at Target is always fun when looking for treasure box goodies. I like to reflect on the previous school year, then set a goal for myself as to how I can make the next one better. I feel like summer is a very reflective time for me in our field, since we finally have the chance to stop and think! I gear up with cleaning my work spaces in both of my schools. There's something to be said for clearing everything out, getting all the crumbs out of drawers and things, and putting fresh pens in my pen holder. Ok, so it goes back to new school supplies too – still a kid at heart! Decorating my office helps me start the year on a positive, colorful note. No more grey boring walls! I gear up by getting all my neglected non-school stuff done at home (e.g., organizing the pantry, making sure I have enough clothes that fit, deep cleaning of the floors). Then once school starts I can spend the next 9 months neglecting all that stuff again! My resolution is not to wait until the week a report is due to begin testing and writing the report. I don't want to write up until the minute before the meeting if I can help it. This school year will be my first year as a School Psychologist, my new school year resolution is to become much more comfortable leading SAT meetings and presenting my findings. More than anything else related to the job, these meetings give me anxiety… I hope to get rid of most of that anxiety by the end of the year. Awesome giveaway! I finished my internship this spring and will begin my first full year as a School Psychologist this fall. To me, the most anxiety-provoking aspect of being a School Psychologist is leading SAT/IAT meetings and presenting information to the team. My new-school-year resolution is to eliminate most of the anxiety I experience during the meetings (not all, I need some to stay on top of my game). I started back in on the 1st, but took a little time to stock up on new pens and Diet Dr. Pepper my first day back! My goal is to be better about writing reports right after I finish testing, instead of moving onto another testing case and having the reports build up! Organizing! I usually leave for summer break in a haste, trying to finish as many reports as possible. Thus, the beginning of the school year means putting everything in order again, especially when I get a new school. My resolution: Make my office more welcoming. I tried to post before, but it didn't show up so I'll write again. I'm going to get myself organized and test and write as quickly as I can after receiving the assessment plan. My new school year's resolution is to stay as organized three months into the year as I am the first month! I use Excel to log my cases with due dates to stay in compliance. It also is helpful for taking notes on students I'm monitoring in POI, transfers, consultation, etc. I gear up by making sure all my files are closed out and I've stocked up on protocols. Thx for the chance to win your book! Back to school shopping and couponing to get the most deals on the tons of (way too much) "cool stuff" I end up giving away frantically later when organizing.. A new organizer, and some new comfy-don't-make-noise-in-hallway shoes also get me geared! I will be starting my school psych internship when school starts back up next month, so simply just trying to relax and prepare myself for what's to come! Stocking up on fruits and veggies to boost my energy and health before heading back! I gear up by cleaning up my closet. I also choose one new organizational tool to incorporate into my routine to help make things a bit more efficient. I am in a new district this year, so I'm trying to learn the basics — where is the staff restroom, who do I turn to for questions, and how can I log onto my computer and access my voicemail. I'm really excited about the new school year. I am going to keep better tabs on due dates and use google calendar popups for reminders. I am also going to buy a shredder if my new school does not provide one b/c I hate shredding a big stack at the beginning of the year. I want to shred as I go! My biggest tip: use google calendar for everything. It's password protected and you can put all your personal and work appts on one calendar that is beautifully color coded. School supplies and a colorful planner always gets me excited for a new school year! I currently have two new rooms; one at a new site and a different room at an old site. I started last week, so my "gear up" period is actually in July, but to start fresh before the kids are there, I make sure to have the office ready to go. Supplies, decorations, tables, etc.